Whether in support of students, schools, communities or populations, education is a calling. 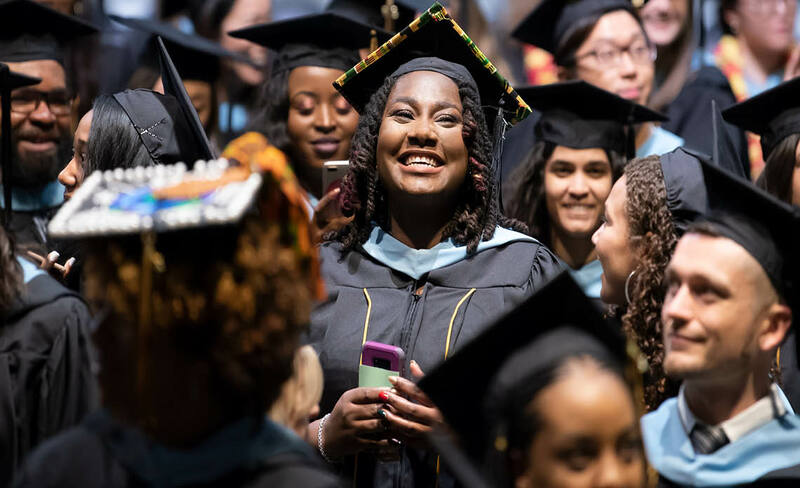 By joining the Johns Hopkins School of Education, you’ll do more than pursue a rewarding career. You’ll unite with other leaders in a common cause. The student community at the School of Education is diverse and we welcome students from all over the world to join us. If you are an international student interested in applying to a program at SOE, you must follow the same application process and submit the same general application materials as your peers, along with some additional requirements. When completing the application, provide your full legal name, as listed in your passport. If your transcripts or other supporting documents were issued in another name, also include that name on your application and attach a letter of explanation and evidence of the name change. Applicants should visit the admissions requirements and deadlines section for more information. Where listed as rolling admission, prospective international applicants should follow the priority consideration deadlines. For summer semester admissions, international applicants may be considered for full-time graduate degree programs only. Applications for part-time degree programs beginning in the summer will not be considered. Transcripts from institutions outside the United States must be evaluated by an accredited independent evaluation agency. The evaluation should be a detailed documents including all course titles, credit hours, grades, grade point averages (GPAs) – course by course evaluation, United States degree equivalency, and date of degree conferral. Applicants whose native language is not English or who are not citizens of countries where English is the official language are required to submit official TOEFL (Test of English as a Foreign Language) or IELTS (International English Language Testing System) scores. Tests must be taken within two years from the intended term of entry. (Please use the institution code 8585 to have your TOEFL scores sent to SOE. A code for IELTS is not required.) To be considered for admission, there are minimum required scores that you need to meet. The English language proficiency requirement may be waived if the applicant meets at least one of these criteria: is a citizen or permanent resident of the United States, or a citizen of the United Kingdom, Ireland, Australia, New Zealand or Canada (except Quebec). Applicants who are citizens of India, Pakistan, the Philippines, Hong Kong, Singapore, etc. are not exempt from the requirement. At the time you apply to JHU SOE, you need to have studied in full-time status for at least two academic years within the last five years in the United States, the United Kingdom, Ireland, Australia, or New Zealand, or with English language institution in Canada or South Africa. Even if English was the language of instruction at your school, if you did not study in one of these countries you are not exempt from the requirement. You must submit a transcript that shows you attended college in one of the approved locations, and that your academic program was at least two years in length. You are also required to complete the TOEFL/IELTS waiver form available within the online application. The program the applicant is applying to will determine and request the additional evidence of English proficiency required for admission. The program may grant a waiver from the TOEFL/IELTS requirement if the applicant has demonstrated by other means sufficient proficiency in spoken and written English for success in the program. An applicant may file a TOEFL/IELTS waiver request form when submitting his/her application to the Office of Admissions. Some international applicants may be admitted with the requirement that they complete an approved workshop(s) and/or course(s) in spoken and/or written English. An international applicant requiring a student (F-1) visa to attend school must obtain full admission to a degree program well in advance of the start of the semester. The School of Education does not issue certificates of eligibility (Form I-20) for 1) conditional acceptance to a degree program, 2) a fully online program, or 3) any certificate programs. The application and other required admission documents must be received by the Office of Admissions on or before the posted application deadlines. If applications and other required documents are not received by the Office of Admissions on or before the deadline, the application will automatically be considered for the next available semester. Students seeking an F-1 visa are required to show proof that they can afford all tuition and expenses for the academic year in order to receive their I-20 status. In order to maintain F-1 visa status, students must adhere to the regulations set by the U.S. Citizenship and Immigration Services (USCIS). Failure to abide by any of the regulations could result in students being considered “out-of-status” by USCIS. Upon arrival at Johns Hopkins, international students on an F-1 visa are required to visit the OIS and bring passports, I-94 cards, and I-20s. Before leaving the United States for any reason, the I-20 must be signed by an OIS staff member in order for the student to re-enter the country. It is imperative to schedule an appointment with the OIS four weeks prior to the departure date. Students on an F-1 visa must pursue a full course of study at the school listed on the currently valid Form I-20 during every academic session or semester, except during official school breaks. Full-time status/full course of study is defined by the School of Education as being enrolled in minimally nine credits each fall and nine credits each spring semester for graduate study, and as being enrolled in minimally 12 credits each fall and 12 credits each spring semester for undergraduate study. Credits completed during the January intersession are counted toward the spring semester count (for example, three credits completed in the 2019 January intersession and six credits completed in the 2019 spring semester, equate to nine credits for the spring 2019 semester). Summer semester courses are not considered when calculating full-time F-1 visa status, although credit earned during summer semester courses may be applied toward a student’s degree. In order to comply with USCIS regulations, all F-1 students are required to register for the full course load at the beginning of each fall and each spring semester. Other regulations are outlined in the letter the international student receives with the Form I-20. Assisting students on F-1 visas is central to the support for international students provided by OIS. The office can also assist students who hold other nonimmigrant visas and direct them to the appropriate resources or government offices. If students are unclear about the type of visa they should obtain, they should visit the USCIS website for additional information, or contact OIS at 667-208-7001 or ois@jhu.edu with any questions. All current international students on F-1 visas sponsored by the School of Education are automatically subscribed to the International Service listserv upon the first semester of enrollment. Regular updates are sent regarding visa-related matters and other items of interest to international students. Note: Federal financial aid is not available for international students. Note: For summer semester admissions, international applicants may be considered for full-time graduate degree programs only. Applications for part-time degree programs beginning in the summer will not be considered. International applicants who hold types of visas other than an F-1 visa and who wish to enroll as part-time Graduate Special Students (non-degree) should follow the application directions outlined under Graduate Special Students (non-degree). International graduate students attending other institutions on student (F-1) visas during the regular academic year are also welcome to enroll as Graduate Special Students (non-degree) during the summer. Please note that public transportation is not available from the Homewood Campus to the Columbia Center. In most programs, students are expected to travel to different campuses for classes. Traveling time during the non-rush hours between Homewood and Columbia is 35 minutes (approximate times – depending on routes of travel). F-1 students are required to show proof that they can afford all tuition and expenses for the academic year in order to receive their I-20 form. In order to receive a student (F-1) visa, you must be fully admitted to a degree program well in advance (approximately two months before) of the start of the semester. Full-time status is defined as being enrolled in a minimum of nine credits for graduate study or 12 credits for undergraduate study each semester (fall and spring). SOE does not issue I-20 eligibility certificates for provisional or conditional acceptance to any program, fully online programs, nor do we issue an I-20 for graduate certificate programs.